Prominent Social Democratic Party MP says Germany shouldn't supply weapons 'to areas of tension' or 'to dictators'. 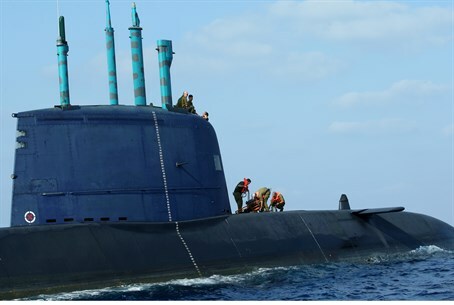 As the INS Tanin, Israel's fourth and most advanced Dolphin class submarine, is making its way to Israel from Germany, it has elicited criticism from various German political leaders in terms of continuing the supply of weapons to Israel. According to a report in Die Welt, Germany’s Vice Chancellor Sigmar Gabriel has recommended a cutback in arms exports to the Jewish state. Vice President of Germany’s Social Democratic Party, Ralf Stegner, in an interview in Welt am Sonntag echoed this sentiment, saying “"We want a clear policy change. Germany cannot provide weapons to areas of tension and certainly not to dictators,” questioning German support for Qatar, Saudi Arabia, as well as for Israel. During the Second Intifada, then-Chancellor Gerhard Schroder led a campaign to temporarily suspend certain military exports to Israel. And more recently, the German left – some of whom have aligned themselves with Arab countries - have called for Germany to put an end to their “special relationship with Israel” altogether, and completely stop the supplying of any German weapons to her. However, in sharp contrast to Stegner, Florian Hahn of the Christian Socialist Union told Welt am Sonntag that “Israel is the beacon of democracy in the Middle East,” adding that Chancellor Angela Merkel has never wavered from this position. The comments appear to be the latest fallout from Protective Edge, during which both the US and Britain threatened to withhold weapons sales to Israel in order to exert pressure over Israel's military decisions. But Garbriel has a long history of anti-Israel comments. In 2012 he branded the country "apartheid" after visiting Hevron, in a move that was criticized by both Jewish leaders and his political opponents alike.